Provide comfort for the family of Mable Jenkins with a meaningful gesture of sympathy. 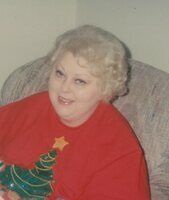 Mrs. Mable Lynette Jenkins, 70, of Emerson died on Thursday, January 17, 2019 at Cartersville Medical Center. Born in Rome on February 9, 1948 she was the daughter of the late Charles and Lillian Martin. She was also preceded in death by her sisters, Margaret Summey and Judy Mashburn; her nephew, Alton Summey; and her niece, Nancy Eaves. Mrs. Jenkins was a member of Sam Jones United Methodist Church. She loved to paint and work in her flower garden. She enjoyed being around people and doing their hair. She loved animals and her family. She will be remembered for being a loving and devoted wife, mother, and grandmother. Survivors include her husband of forty three years, John M. Jenkins of Emerson; her sons, Greg Jenkins (Sheree) of Kingston, and T.J. Eaves (Jaycee) of Euharlee; her granddaughters, Ava Jenkins and Sydney Eaves; a great-granddaughter due in March; her nieces, Lisa Crisp (Critter) of Cartersville, and Terre Summey (Joe) of Cartersville; and her dog, Maggie. Funeral services will be conducted at 2:00 p.m. on Sunday, January 20, 2019 in the chapel of Parnick Jennings Funeral Home and Cremation Services. A private entombment will follow in Sunset Memory Gardens. The family will receive friends from 5:00 p.m. – 8:00 p.m. on Saturday evening at the funeral home. Parnick Jennings Funeral Home & Cremation Services is honored to serve the family of Mrs. Mable Lynette Jenkins, please visit www.parnickjenningfuneral.com to share your memories or leave a condolence message. To send flowers in memory of Mable Lynette Jenkins, please visit our Heartfelt Sympathies Store. We encourage you to share your most beloved memories of Mable here, so that the family and other loved ones can always see it. You can upload cherished photographs, or share your favorite stories, and can even comment on those shared by others. Provide comfort for the family of Mable Lynette Jenkins by sending flowers. We have been knowing Lynn for years. Thinking of you in this time of sorrow and extending heartfelt sympathy. Always so sweet to us, and our families, also. Take care and God Bless, always. I extend my condolences to the family of Mrs. Mable. May your hearts be comforted by knowing that Mrs. Mable is God's Loving Memory and He will not forget her. Acts 24:15 " And I have hope toward God that there is going to be a resurrection ." May those words of hope help to ease your pain of grief.